First of all let’s recognise that OCD is diagnosed “by degree of severity”. In other words it’s a label. So whether you have been formally diagnosed as having OCD or not; where obsessional and/or compulsive problems exist then the principles of treatment remain the same. 4. The person recognizes that the obsessional thoughts, impulses, or images are a product of his or her own mind. In addition to these criteria, at some point during the course of the disorder, the sufferer must realise that his/her obsessions or compulsions are unreasonable or excessive. Moreover, the obsessions or compulsions must be time consuming (taking up more than one hour per day), cause distress, or cause impairment in social, occupational, or school functioning (Quick Reference from DSM-IV-TR, 2000). OCD often causes feelings similar to that of depression. · The Orbital Cortex – This area of the brain is located just behind the eyebrows. It is involved in the initial perception of fear and danger. It detects whether something is “right” or “wrong”. 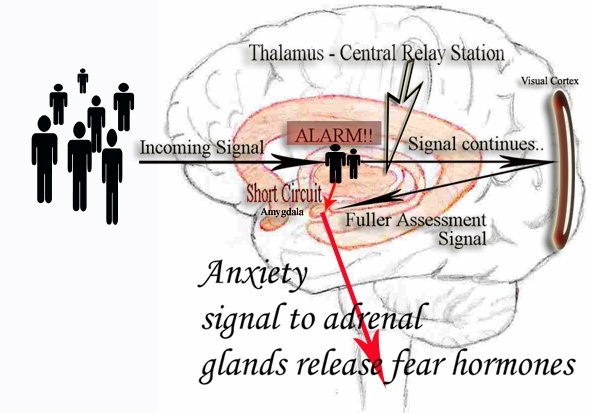 · The Anterior Cingulate Gyrus is activated by detection of fear and causes our mood (the feeling that something is not right) to respond with fear sensations such as churning stomach and anxiety.  · The Caudate Nucleus is the “filtering station” for the thoughts which come from the Orbital Cortex. It is involved with “automatic transmission”, which means it is the part of the brain which switches from one thought or behaviour to another. It is basically the on/off switch. It looks complicated but it is worth understanding. It is believed that in OCD sufferers the Caudate Nucleus dysfunctions. The Caudate Nucleus is like a gate. It has an on position and an off position. “On” means action is required. “Off” means everything is ok. In a non-OCD person, when a fearful perception (an error detection) comes in through the Orbital Cortex and is passed to the Caudate Nucleus for “filtering” it is usually dealt with appropriately (we act) and then the Caudate Nucleus having responded, switches from “On (Action required) to “Off”(action not required) . Thus the gate closes and the automatic transmission shifts gears back to “ordinary” awareness. It is believed that in OCD sufferers (and we note that this can be due to over-use of the mechanism because of negative introspection, anxiety, and continued worry), the gate gets stuck in the “on” position. “On” becomes the norm. Here we have compulsions….the feeling that even though we have acted there is still more to do, because normally this gate would close and the urge to act would cease. In OCD, it doesn’t close, so the urge continues. Now we have an extra problem too because this feeds back to the Orbital Cortex that something is STILL wrong, and this arouses the Orbital Cortex further that there are “errors” which it sends back to the Caudate Nucleus which then tries to put it right by acting, and round it goes in a vicious cycle; each part of the brain continually arousing the other! Put simply then, the filtering mechanism which is the Caudate Nucleus fails to filter properly and the feeling that something is wrong persists and increases with each cycle. The Orbital Cortex literally overheats. It becomes highly over-active, and this means that it too starts to dysfunction and detects more and more errors and so on it goes. Now, if this wasn’t bad enough already, to add to the mix we have the fact that now the Anterior Cingulate Gyrus gets involved too. In OCD the Cingulate Gyrus, which is responsible for the modulation of “feelings” gets “locked tight” to the Caudate Nucleus, and this creates feelings of fear and dread, or at the very least unpleasant “moods”. The amygdala which is responsible for extreme fear and panic, can also be triggered into action by these faulty messages. The understanding is then that in treating OCD we have to use the Frontal Lobes (what we would refer to as the Intellectual or Executive brain/mind) to do the job that the Caudate Nucleus is failing to do properly. Studies have shown that when the Caudate Nucleus is not working properly then the cortex (the Intellectual or Executive brain/mind) must help out, so conscious thought is necessary to shift behaviours. Shifting thoughts and behaviours is no longer “automatic” and we now have to use the intellect to do it. So using the Cortex to stand in for the faulty Caudate Nucleus, we can get the brain to re-wire. Again we know that the brain shows a certain amount of “plasticity” meaning that the brain can re-wire itself in certain ways. If one part stops functioning properly, then it can often find another way of creating the necessary function. The team at UCLA found a link. They found that there is a pathway from the Basal Ganglia (The Caudate Nucleus) to the Frontal Cortex which would explain why the two areas can demonstrate this plasticity. It is of course the continued repetition of shifting thinking, and the conscious re-adjustment of responses and behaviours which creates the change. Understanding this also complements our own way of thinking that by reducing anxiety generally we return more control to the Frontal Cortex (the Executive/Intellectual) brain. This is true in all people, not just in OCD. In so doing we make it literally easier to undertake the behavioural therapy. The picture shown here gives us even more leverage in approaching OCD rationally. We can see that there are basically two routes for incoming information. If you look at the "incoming signal" you will see that the information incoming (first solid arrow) goes to the Thalamus. The Thalamus is the brains central relay station. It is the thalamus which makes the initial assessment on where to route information. 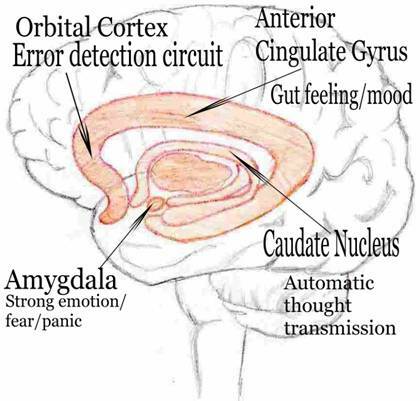 As part of our primitive survival mechanism we see that there is a short cut route which goes directly to the amygdala which is represented here by the red arrow marked "Short Circuit". The second larger solid black arrow (signal continues) is also information being routed to the amygdala but you will note that this second bunch of information is routed via the visual cortex (or if it's a different perception such as a sound then it's routed through the relevant processing area). This is clearly a longer route, and it consequently takes more time to register. We can see that the information routed via the visual (or other) cortex arrives at the amygdala as a "fuller assessment signal". It is interesting that we can respond to incoming information before we have become consciously aware of any danger. Consider how an eyelid will close automatically to protect the eye when a projectile comes close. You don’t register the projectile and then close your eye…it happens automatically. What we are seeing here is the brains natural mechanism for split-second reactions. There may be literally milliseconds of difference in reacting and registering but these milliseconds can make all the difference in emergency situations. If you think about your own experiences in this regard, have you ever experienced something which made you jump before you knew what it was and then immediately afterwards you recognise that the threat level was overestimated and you relax? What is happening there is that the first bunch of routed information short-circuits the visual cortex and goes straight to the amygdala, which is the area of the brain which registers immediate fear and panic…evasive action! There is an immediate response or reaction. Literally milliseconds later, the longer routed but much more complete picture arrives via the visual cortex (and other “sorting” areas of the brain”). So the initial short circuited information is very vague. The brain doesn’t quite have the full picture of the threat but it responds with fear anyway, because it is better to be safe than sorry! Here’s where it gets interesting for us though because the second bunch of information which carries a much fuller analysis of the situation can now “dampen” the fear response if it is considered that the threat is less urgent than the first impression suggested. This is natural. Suppose there is an explosion in front of you. You duck, flinch, screw your face up and close your eyes tight. Half a second later you see that the cat knocked your favourite vase off the kitchen windowsill and it has shattered into a thousand pieces. What do you feel? Sorry for your vase yes, but more immediately than that …initially relieved. This is the dampening effect that the second fuller routing of information brings. On recognising that the danger is not life threatening, your system immediately calms itself. All this in 1-2 seconds! So why does this matter to us? Well, think about how OCD works. An obsessive thought comes in. There is immediate alarm. What is this? Well, this is information bunch number one bypassing the intellect and going straight into the limbic system (the emotional mind of which the amygdala is a part!). So the immediate initial feeling is one of “wrongness”. Then information bunch number two arrives just milliseconds later. Now here is where OCD does its mischief. Because the “feelings” are so pervasive with OCD, invariably here, the sufferer “buys in” to the assumption that something is terribly wrong, and the “worry” circuit goes on. You are not to be blamed for that. We know it feels for all the world as though something is terribly wrong. The thing is though…..It’s Not True! So this is really important to understand. You get two shots of information. The first you can do little about initially (although hypnotherapy is great for sorting out the first bunch of signals…I’ll explain that separately), so you get the feeling, but you must recognise that the second shot of information IS up for grabs! You have to recognise a) that you can do something with this second bunch of information, and b) that you have to become practiced in the art of catching it at work before you “buy in”, and then amending your conscious awareness of what that feeling really means, thus “dampening” the fear. We don’t expect it to go away altogether immediately, but the minute you realise that you CAN make a difference, even if it’s only a minor one, then you are on your way back to control! This is an excellent model for helping you to really understand HOW to overcome OCD. As you begin to see more and more the truth of this in action you will become more and more adept at catching the OCD before it’s had time to worry you. Later in this article you will find Dr Schwartz’s 4 step plan for making this process rock solid! Patience: It takes time to overcome OCD. Usually months. With regards to your treatment, that doesn’t mean that you will necessarily need to have a session every week for the next however many months. Treatment can be spread out over longer periods of time once we’re underway. But it is SO important that your expectation is realistic. In our modern culture we often want everything now, and it’s often delivered now, so we can come to expect that all too easily. Some things in life don’t work that way. OCD is one of those things. In terms of what OCD is, it’s worth remembering that these patterns of thought and behaviour have been engrained over a long period of time and it just simply takes time to change patterns like these. We overcome OCD by winning small victories which increase confidence, which change the way the brain is patterning behaviours and feelings and then bit by bit…inch by inch we take back control. It is crucial to get this into perspective from the beginning of treatment. You might remember Jade Goody collapsed in her London Marathon attempt in 2006 because she failed to recognise that you can’t just run a marathon without any training. In other words she failed to prepare properly for the task ahead. The same principle applies here except that your preparation is Mental rather than physical and it comes from recognising that this is a marathon…. not a sprint! I wish I could tell you otherwise, but please do not let this fact dishearten you. You don’t have to have reached the finish line to be feeling good about the race. As you make progress it will become easier and easier to build on that progress. It is ALL forward movement! Overcoming OCD requires perseverance. Some days you win. Some days you lose, but as long as we win more races than we lose, in the long run we are winning! Therefore we require courage and determination. It’s a subtle mix of being strong yet compassionate with ourselves. Pushy yet sensitive. We need to dig deep and hold that determination…remember these words ….“never give up …never give up!”. In practice it’s usually the case that we take three steps forwards and one step back. Expect this and you will then be mentally prepared for setbacks. Then you can say “Ok….I knew this might happen, but it’s temporary…I made good ground before …I will do it again…this is a difficult time…it will pass”. Use your heart (emotionally speaking) to fight for your life. Be clear about your intent. Be clear that you will do what it takes to overcome this difficulty. There is so much power in this stance. Resolve to stop being a victim and dig deep to find the determination to beat this thing. We know it CAN be done, so be determined that you’re going to be one of the winners! And if you fall off, then get up, dust yourself off, and get back on! Remember that courage is not the absence of fear - it is the decision that something else is more important than that fear….in this case your life! True courage is based on being willing to support oneself emotionally even when the fear is telling us it’s impossible. A lovely old Confuscious quote comes to mind. “He who says it cannot be done should not interrupt the person doing it!” He who says it cannot be done in this case is your OCD! It is unfortunately true that healing often takes place at a cost to the person being healed, but do remember that the cost is temporary but the resulting good health is priceless. You are not a bystander in this therapeutic process. Quite the opposite in fact. This is an “active” process, meaning that work done takes place in every day life as well as during our therapeutic sessions. The price in this case means making changes. It means effort. We have to be willing to pay that price. It means being willing to challenge old patterns, to think new thoughts, to try new behaviours. This takes energy. There is expenditure. It’s all change, and that often feels scary and costly to an unconscious mind. We are entering the Unknown as far as the unconscious mind is concerned (Who are you if you are not your OCD?) It’s a well established fact that the unconscious mind left to its own preference will often opt for the miserable but familiar over the functional but new/novel. Why? Because familiar is seen as safe even if it is miserable! (Better the devil you know) Knowing that your mind is likely to want to keep you in old patterns even though you want rid of your OCD is an important fact to recognise because now you are becoming clear that you won’t let the OCD manipulate you any more! Some days, many other factors may contribute to you not feeling strong enough to deal successfully with the OCD. If that happens….it’s okay! Be kind to yourself, and remind yourself that tomorrow you live to fight another day! This is why it’s so important to dig deep and to cultivate perseverance. Here are some courage quotes to get you inspired! "When you are forced to bear the unbearable something dies in you. When a resolute young fellow steps up to the great bully, the world, and takes him boldly by the beard, he is often surprised to find it comes off in his hand. There will be tough days. There will be easy days. There will be days when you know for sure that there are improvements and there will be days when you’ll convince yourself (despite the evidence to the contrary) that nothing has changed. Here is where Trust is a great strength. Let’s be clear that whether we have OCD or not we all have days where we feel like throwing the towel in. We have to cultivate Trust in life. It’s my personal belief and it’s only a belief (but one which has been shown to be true in my experience), that when we really commit to healing (Being clear we’re doing it….. whatever the cost!) then “providence” moves for us. That is to say life begins to reflect back to us what we need in order for that to happen. We could speculate on this phenomenon but it’s a well noted (and scientifically verified) fact that people who believe they are lucky, are in fact luckier (they win more and succeed more), than those who believe that they are not lucky. In other words, once you believe that it’s possible for you to overcome your OCD you then actually set in motion the processes which lead to that positive reality occurring. So this in fact is Trust. Trust that if you do your bit, then providing you’re willing to follow the steps of patience and perseverance, that eventually you will get the result you are working for! We know in fact that Dr Schwartz’s four step behavioural therapy; That is Re-label, Re attribute, Re-focus and Re-value has been shown to consistently improve OCD sufferers lives. Using brain scans, Dr Schwartz and his team were able to show conclusively that the area of the brain implicated in OCD was far less active after successful behavioural therapy. This effectively PROVED that this style of therapy was literally changing the way an OCD sufferer’s brain was working. Therefore, if you have a day where your OCD is telling you the whole thing is pointless and useless (and it feels that way too), it’s important to TRUST the process and trust the therapy. The evidence is there. OCD can be overcome, and as far as we know, this therapy is the most effective way of doing that. We know it works. We know that anyone can use it. Trust that by following the steps of the formula and by continuing to demonstrate patience and perseverance in the face of adversity that things ARE improving and WILL continue to improve! Okay, Well, let’s break it down. Re-label: This feeling that something is wrong is due to my general anxiety but my brain is mis-firing as a result of that anxiety and the fear is being focused on this obsessional thought. Thus the focus of my obsession is NOT real, it is only a feeling that my brain is mistakenly generating which is due to anxiety. Here you have re-labelled the obsession (the focus of the fear) and by doing so have taken the first step in resuming control because you are not “buying in” to the lie. The main characteristic here is that the feeling IS NOT YOU! You are not a bad person because you had the thought. The OCD is not who you are. Be clear about this by re-labelling and seeing the OCD for what it is….. a misfiring signal…a false alarm! Re-attribute: We know that the cause of the feeling that something is wrong is in the fact that the emotional centre of the brain, the housekeeping function, has become mistakenly concerned that we are being threatened. We can therefore KNOW intellectually that the feeling we are having is the OCD and not the problem which it FEELS like. Therefore we are learning to distinguish between what is objectively REAL and what is an overdone emotional response. when you ask yourself “Is this a reasonable response?” If you can’t honestly answer that rationally it is reasonable, then you know the feeling is deceiving you, and it’s not a real fear ..it’s OCD. The rule to remember is that OCD can mimic reality but reality can never mimic OCD. In other words the rule for this is “If it feels like it might be OCD then it is OCD!” You recognise “I am not the thought. I am not the feeling. I am the observer”. Then you can now say “This is not me…it’s the OCD”. So now you have relabelled the feeling as “not you” and re-attributed it’s importance by recognising that the feeling is attributable to a faulty Caudate Nucleus and anxiety generally (the OCD) and not the object of obsession. Go and DO something else. It is very important that you recognise the importance to DO something differently. This is the crux of the therapy. It is not enough to simply think about doing something differently, one must actually DO something differently. So suppose the compulsion was to clean ones hands, well here you will actually change course and decide to do something else. Using the first two steps as your mantra you continually remind yourself that the compulsion to clean your hands is not truly proportionate to the perceived danger (it is a misfiring in the brain!) and you go and DO another activity. This has the practical effect of changing the habit of doing what you have always done, disagreeing with the unconscious minds assertion that you must be in danger. By refusing to carry out the compulsion you send a message back to your unconscious mind that says “I disagree with the feeling you are sending and I refuse to act upon it. You will need to make the adjustment. Not me!” It is this process which over time causes the brain and the mind to begin to literally function differently. The brain adjusts. The unconscious mind works on a feedback loop and as we discover through repetition that nothing untoward occurs when we refuse to carry out a compulsion then the brain eventually starts to take this on board and change the assumption (and the feeling) that something is wrong. You can see therefore that the opposite is also true that when you carry out a compulsion you actually strengthen the OCD because you are saying to the brain “Yes, I agree that there is danger and I will take steps to fix it” So here then DOING something differently changes the message. It is this process which over time causes the brain and the mind to begin to literally function differently. Practically speaking you need to have some alternative behaviours to hand that you can switch into to occupy your mind. The behaviours should be pleasant and constructive. Ideal behaviours are something you can really distract yourself with. So arts and crafts are obviously good. Learning a language might help (but not if it’s stressful for you), but practically any hobby-like activity will help, as long as it is something where you can literally re-focus your mind. See if you can commit to the 15 minute rule. If you can last fifteen minutes reminding yourself that the feelings and thoughts are faulty messages from the brain, then you will often find that the feelings fade before the 15 minutes are up! Each time you do this, you are winning! If you really can’t do 15 minutes, then pick the longest time you think you can do, and challenge yourself to do longer each time. Build it up as you go. Make a note of ANY positive change. This leads to the pay off in the next step. So this is the pay-off step. Re valuing is where you get to see for yourself that obsessional thoughts and behaviours (compulsions) are truly “worthless distractions to be ignored”. In practice this is what overcoming OCD is all about. So as you look back on each victory and see that by re-labelling, re-attributing and re-focusing you were able to beat the OCD, so you also can then re-value the obsession/compulsion with the benefit of this information. Every small victory you have with overcoming an obsessional or compulsive pattern is one step nearer to being OCD free because each time you win, you revalue again. Over time this gets easier and easier as your brain begins to really cognise that the fear (obsession and compulsion) is really unnecessary. The general principle here is that seeing (your results) is believing, and that the more clearly you see what OCD symptoms really are, the more rapidly you can dismiss them as worthless garbage that is not worth paying attention to. We have chosen to use the Dr Schwartz 4 step plan outlined here because to the best of our knowledge this plan has been shown to be the most effective drug-free treatment available for OCD with an 80% success rate with no relapses that come close to pre-treatment severity. It also sits beautifully within the principles of hypnotherapy which follow very similar understanding. The two treatments therefore work very well together, and the process of using hypnotherapy together with this behavioural treatment proves to be a valuable combination. If you would like to learn more about Dr Schwartz’s methods and research you can buy the book “Brain Lock” from Amazon or most good bookshops. There is more information available on OCD on my sister website here. You can contact me to make an appointment here.